Are you currently in an emergency? What’s the best way to stop the bleed? First, determine how serious the bleeding is. Serious or life-threatening bleeding will be red and continuously flowing. It may be squirting. In terms of amount, serious bleeding might mean there’s a half can of soda’s worth of blood on the ground. It may be pooling on the surface. 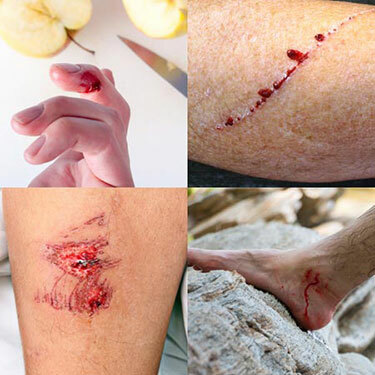 Bleeding like this can occur when a person’s limb is removed during an accident or by an explosive device. Non-serious bleeding sometimes resolves on its own (it clots!). Sometimes it requires some direct pressure. For example, a small paper cut will probably resolve on its own and clot. On the other hand, if you cut yourself while cooking, you might need to apply direct pressure to the cut to get it to stop bleeding. I’m dealing with non-serious bleeding.Non-serious bleeding. Where is the serious bleeding occurring? Apply a tourniquet to treat serious bleeding on arms/legs. If you determine it is serious bleeding on the arms or legs, you need to take action immediately to stop the bleeding. Evaluate that it is safe to remain where you are, and then direct another individual to call 911. 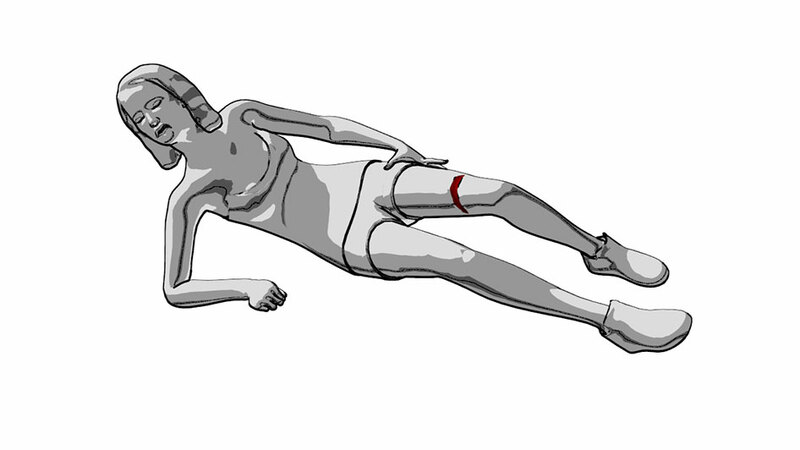 Place the tourniquet around the injured limb so that it is closer to the torso than it is to the wound. Do NOT place the tourniquet so that it is covering the wound. Then, follow these steps to apply the tourniquet – it is a simple pull, twist, and clip! Pull the free end of the Velcro strap, thread it through the buckle, and securely fasten it back onto itself. Twist the rod until all bleeding stops. You will likely need to twist it until you cannot twist anymore. This step may be painful for the injured person. Keep twisting until the bleeding stops. Clip and secure the rod with the small Velcro strap so it does not untwist. Then, confirm that someone has called 911. If the tourniquet is not stopping the bleed and you have tightened it as much as you can, you can apply a second tourniquet above the first. “Above” means that it should be closer to the torso. Leave the tourniquet(s) in place while you wait for health professionals to arrive. Comfort the injured person as much as you can, but do not loosen the tourniquet. When health professionals arrive, turn things over to them. Press and drag thumbnails to the left or right to pan in respective direction. Apply pressure to treat serious bleeding on areas other than arms/legs. First, apply pressure and direct someone to call 911. Remember, pressure stops bleeding. Use your hands to apply firm, steady pressure until bleeding stops. You should hold pressure for at least 5 minutes before looking at the wound. If you can, try to ensure the injured person is on a firm surface. That way, when you apply force on the bleeding, you are pressing into something solid. Using what? If you have gauze available, use that. If not, use whatever you have available, such as a shirt, newspapers, or your hand. First, apply pressure! Remember, pressure stops bleeding. Here is how. How long? There is no definite amount of time. Just apply continuous pressure until bleeding stops. Use your hands to apply firm steady pressure until bleeding stops. You should hold pressure for at least 5 minutes before looking at the wound. If bleeding does not stop, call 911 and continuing applying pressure until medical help arrives. If you can, try to ensure the injured person is on a firm surface. 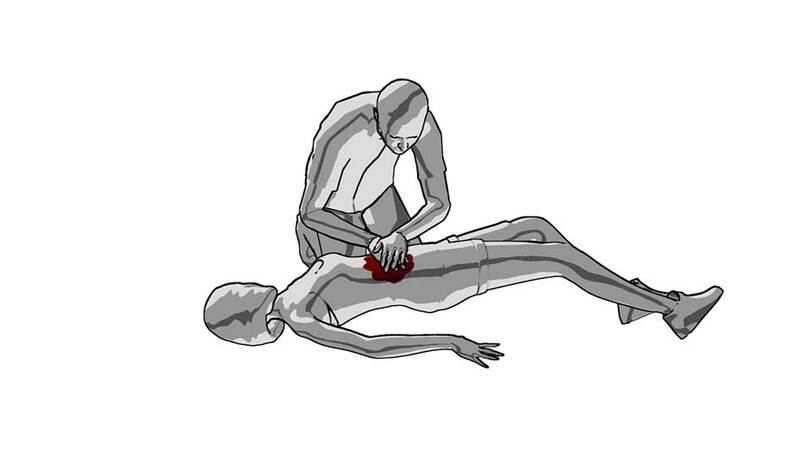 That way, when you apply force to the bleeding, you are pressing into something. Continue applying pressure until medical help arrives. How Much Do You Know about Tourniquets? Think you know all there is to know about tourniquets? Take this quick quiz and see just how much you know. Be sure to challenge your friends’ knowledge while you are at it, and share this quiz on social media. Get the answers to the most frequently asked questions about tourniquets, their safety, and their use. Unintentional injury is the leading cause of death for people ages 1-44 years in the U.S., and it has been since 2005 (see the National Center for Injury Prevention and Control 10 Leading Causes of Death and Injury for more information). Unintentional injury refers to accidents (e.g., car accident) or crime (e.g., injury caused during a break-in). While most injuries do not require a tourniquet, some do. 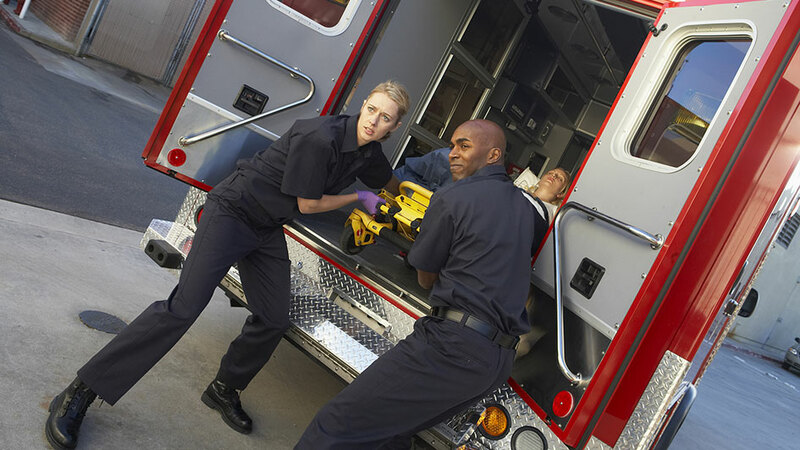 You can save a life by knowing what to do when you are in a situation in which someone is injured. Do tourniquets really save lives? Tourniquets do save lives. In fact, during the wars in Iraq and Afghanistan, they have been used to quickly treat severe injuries. As we mentioned in the Get the Facts section, the 75th Army Ranger regiment had a much lower death rate from survivable injuries than units that did not universally train on tourniquet application. More importantly, 94% of soldiers in the 75th Army Ranger Regiment who were treated with tourniquets survived their injuries. Today, tourniquets are supplied in each soldier’s individual first aid kit. In recent events we have seen combat-type injuries in America. You may be able to save a life if you know how to apply a tourniquet. For instance, police officers often carry Individual First Aid Kits, which include bleeding control devices like tourniquets; by using these kits, police officers were able to save lives in the Louisiana movie theater shooting in 2015. For further information, refer to this article. What kind of tourniquet should I use? Where do I find them? In some public places, you will find bleeding control kits with tourniquets and gauze next to AEDs. You might see them in some airports, such as at the Charlotte Douglas International Airport in their airport terminal building and facility. You can learn more about other initiatives to provide public access and training on how to stop the bleed here. You can also purchase commercially available tourniquets. What if I do not have a tourniquet available? Apply direct pressure. Commercial tourniquets are most effective. If you do not have one available, apply strong direct pressure. Use your hands to apply firm steady pressure until bleeding stops and call 911. How long should/can I leave a tourniquet on? Leave the tourniquet on until medical professionals arrive. How do I protect myself from blood-borne illnesses? If available, using gloves would be best. However, often no gloves are available. You should wash your hands as soon as possible after handling blood and avoid contact with your mouth and eyes. Your risk of infection from HIV and other blood borne illnesses is very low. In fact, the risk of contracting HIV from infected blood coming into contact with non-intact skin (such as scrapes and lacerations) is less than 0.1%. There is no risk of contracting HIV if infected blood comes into contact with intact skin (Source:CDCCDC). Still, if you are exposed to blood, contact your healthcare provider. How do I get a tourniquet? 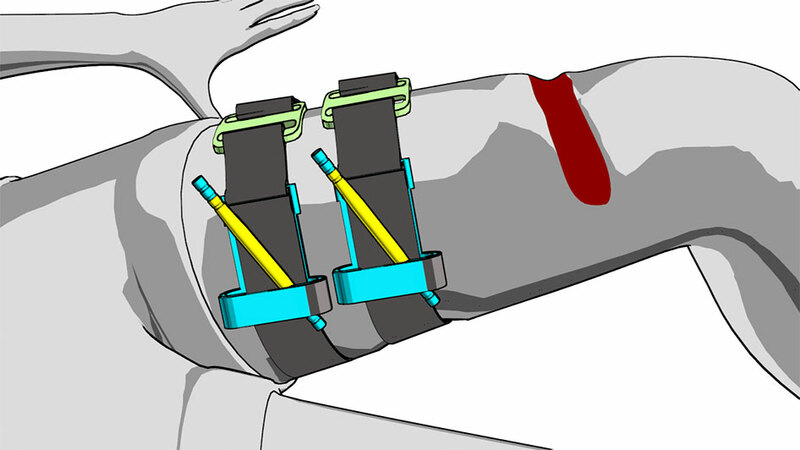 Tourniquets and bleeding control kits are commercially available for purchase. In certain public spaces, bleeding control kits may be available (such as airports). Hemorrhage is the medical term for bleeding. It usually refers to excessive bleeding. A person’s limbs, specifically their arms and legs. A loss of blood that is continuously flowing, and possibly squirting. Serious bleeding results in a large amount of blood loss, possibly around a half can of soda’s worth of blood. Serious bleeding may occur due to severe events such as an accident or an explosion. A loss of blood that only leads to a small amount of blood loss. Non-serious bleeding usually results from less severe wounds and may resolve itself on its own or via direct pressure. To learn more about how to save a life, the Stop the Bleed campaign, or other blood-related information, check out the following resources below. Find out more about education, training, and research in disaster medicine & public health preparedness. Find out more information about the Stop the Bleed initiative and learn how you can support the cause. Find resources for support for natural or human-caused disasters and crises. Learn more about what to do in a bleeding emergency.. Learn about the importance of bleeding control in today’s world. Learn how controlling hemorrhages fits into the THREAT Response Plan. Find out how to take the NAEMT’s course and learn the different methods of bleeding control. 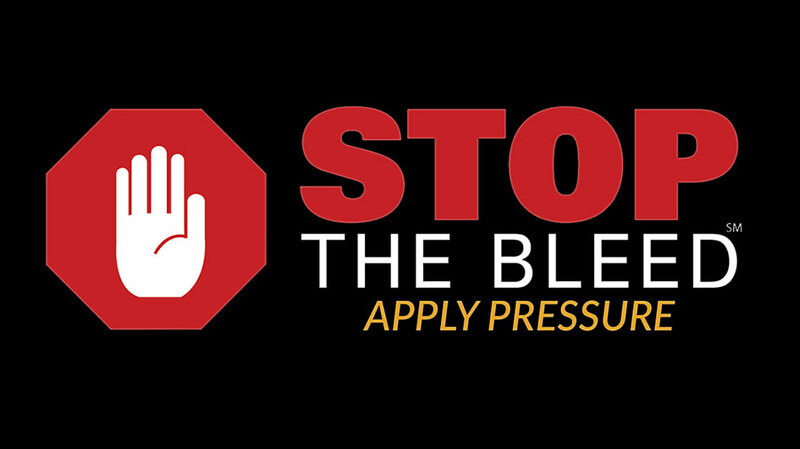 Visit the Stop the Bleeding Coalition’s website to find out more about their efforts to spread the word about controlling bleeding caused by disasters and mass casualty events. Learn more about the White House launch of the Stop the Bleed campaign. Learn what it takes to be an effective immediate responder when disaster strikes.